The descendants of the fourth son of Canaan (Gen. x. 16, I Chron. i. 14). They form part of the ancient inhabitants of Palestine (Gen. xv. 21; Ex. iii. 8, 17, xxiii. 23; Joshua, iii. 10, xxiv. 11; I Kings, ix. 20; Ezek. xvi. 3, 45; also Isa. xvii. 9, where we ought probably to follow the Septuagint reading, "the forsaken places of the Amorites and the Hivites"). As representatives of the whole pre-Israelitish population, they are mentioned in Gen. xv. 16, xlviii. 22; Joshua, v. 1, xxiv. 15, 18; Judges, x. 11; I Sam. vii. 14; I Kings, xxi. 26; II Kings, xxi. 11; Amos, ii. 9, etc. (a) In the south they inhabit the hill-country ofthe Amorites (Deut. i. 7, 19) on one side of the Canaanites (ibid. verses 27, 44), north of Kadeshbarnea. The Amorites in Hazezon-tamar (Gen. xiv. 7) and Mamre (ver. 13) belong to the same region. (b) More to the north Joshua, x. 5, mentions five kings of the Amorites; namely, in Jerusalem, Hebron, Jarmuth, Lachish, and Eglon, as "all the kings of the Amorites that dwell in the hill-country"; compare ver. 12. According to II Sam. xxi. 2, Gibeon also was Amoritish (Joshua, xi. 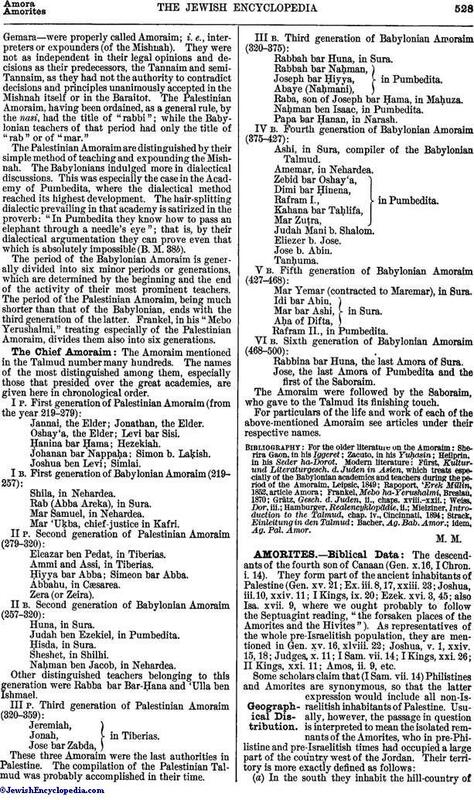 19: Hivitish), although it is more probable that the name Amorite has there the vague meaning discussed above, without precise ethnological signification. We find the "Amorites which were beyond Jordan, westward" (Joshua, v. 1, xxiv. 8), distinguished from the "Canaanites which were by the sea" (ibid. v. 1); Joshua, xi. 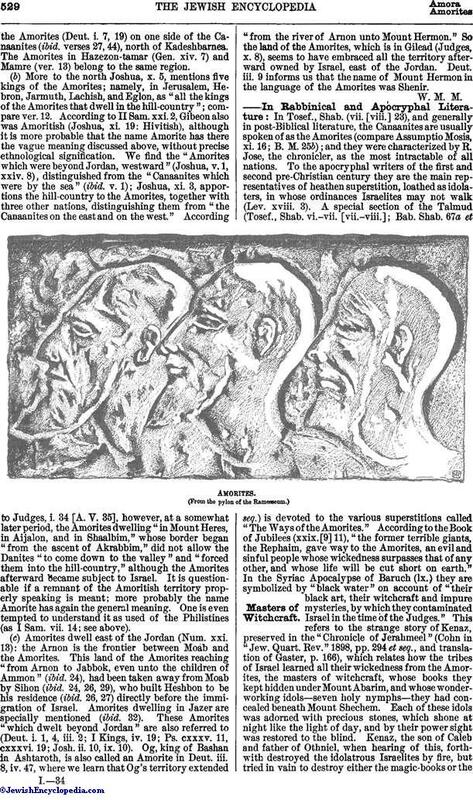 3, apportions the hill-country to the Amorites, together with three other nations, distinguishing them from "the Canaanites on the east and on the west." According to Judges, i. 34 [A. V. 35], however, at a somewhat later period, the Amorites dwelling "in Mount Heres, in Aijalon, and in Shaalbim," whose border began "from the ascent of Akrabbim," did not allow the Danites "to come down to the valley" and "forced them into the hill-country," although the Amorites afterward became subject to Israel. It is questionable if a remnant of the Amoritish territory properly speaking is meant; more probably the name Amorite has again the general meaning. One is even tempted to understand it as used of the Philistines (as I Sam. vii. 14; see above). (c) Amorites dwell east of the Jordan (Num. xxi. 13): the Arnon is the frontier between Moab and the Amorites. This land of the Amorites reaching "from Arnon to Jabbok, even unto the children of Ammon" (ibid. 24), had been taken away from Moab by Sihon (ibid. 24, 26, 29), who built Heshbon to be his residence (ibid. 26, 27) directly before the immigration of Israel. Amorites dwelling in Jazer are specially mentioned (ibid. 32). These Amorites "which dwelt beyond Jordan" are also referred to (Deut. i. 1, 4, iii. 2; I Kings, iv. 19; Ps. cxxxv. 11, cxxxvi. 19; Josh. ii. 10, ix. 10). Og, king of Bashan in Ashtaroth, is also called an Amorite in Deut. iii. 8, iv. 47, where we learn that Og's territory extended "from the river of Arnon unto Mount Hermon." So the land of the Amorites, which is in Gilead (Judges, x. 8), seems to have embraced all the territory afterward owned by Israel, east of the Jordan. Deut. iii. 9 informs us that the name of Mount Hermon in the language of the Amorites was Shenir. In Tosef., Shab. (vii. [viii.] 23), and generally in post-Biblical literature, the Canaanites are usually spoken of as the Amorites (compare Assumptio Mosis, xi. 16; B. M. 25b); and they were characterized by R. Jose, the chronicler, as the most intractable of all nations. To the apocryphal writers of the first and second pre-Christian century they are the main representatives of heathen superstition, loathed as idolaters, in whose ordinances Israelites may not walk (Lev. xviii. 3). A special section of the Talmud (Tosef., Shab. vi.-vii. [vii.-viii. ]; Bab. Shab. 67a et seq.) is devoted to the various superstitions called "The Ways of the Amorites." According to the Book of Jubilees (xxix. 11), "the former terrible giants, the Rephaim, gave way to the Amorites, an evil and sinful people whose wickedness surpasses that of any other, and whose life will be cut short on earth." In the Syriac Apocalypse of Baruch (lx.) they are symbolized by "black water" on account of "their black art, their witchcraft and impure mysteries, by which they contaminated Israel in the time of the Judges." This refers to the strange story of Kenaz, preserved in the "Chronicle of Jerahmeel" (Cohn in "Jew. Quart. Rev." 1898, pp. 294 et seq., and translation of Gaster, p. 166), which relates how the tribes of Israel learned all their wickedness from the Amorites, the masters of witchcraft, whose books they kept hidden under Mount Abarim, and whose wonder-working idols—seven holy nymphs—they had concealed beneath Mount Shechem. Each of these idols was adorned with precious stones, which shone at night like the light of day, and by their power sight was restored to the blind. Kenaz, the son of Caleb and father of Othniel, when hearing of this, forthwith destroyed the idolatrous Israelites by fire, but tried in vain to destroy either the magic-books or thestones. So he buried the books, but in the morning found them transformed into twelve precious stones, with the names of the twelve tribes of Israel engraved thereon, and later they were used in Solomon's Temple. Then, with the help of the angel Gabriel, he smote the Amorites with blindness and destroyed them with his sword. 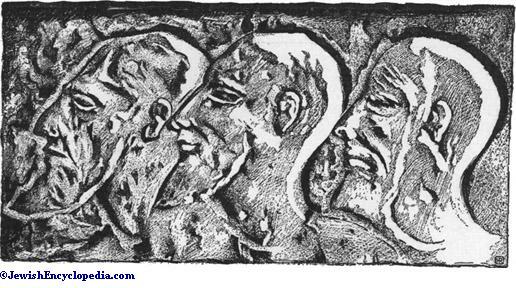 These legends may be regarded as reflecting the prevalent belief of the Jewish people in Amorite witchcraft. But the ancient midrashic and apocryphal narratives of battles fought by the sons of Jacob with the Amorites seem likewise to rest upon the actual warfare which took place between the Jews and the surrounding nations during the second Temple. According to the Book of Jubilees, § xxxiv. ; Testament of Patriarch Judah, 3-7; Midrash Wayis'u, in Jellinek, "B. H." iii. 1-5; "Chron. of Jerahmeel," ed. Gaster, §§ xxxvi., xxxvii., and Sefer ha-Yashar, xxxvii.-xl., the sons of Jacob fought with the sons of Esau, while the Amorites sided with the latter and were defeated. The battlefield described in the various sources being almost identical with the battle-place of the Maccabean heroes, it is much more likely that the story originated in the time of John Hyrcanus, when war was successfully waged against the Idumeans and other nations, than that it arose in the time of King Herod, as Gaster thinks ("Chronicle of Jerahmeel," preface and lxxxii. ; compare Book of Jubilees and Edom). The monumental evidence is as follows: Egyptian inscriptions (see W. M. Müller, "Asien und Europa," p. 218) call the land east of Phenicia and north of Palestine "the land of the A-ma-ra." The Amar, or Amor, of the texts is chiefly the valley between the Lebanon and Antilebanon mountains, the modern Beka'a. In the El-Amarna tablets (Winckler, Nos. 42, 44, 50), Aziru, the prince of the same region, is called "Prince of Amurru." The latter name does not seem to be much more comprehensive than in the Egyptian texts, and certainly does not apply to Palestine. Only in the later cuneiform texts the old expression Amurru (not to be read "AḦarru") is used so vaguely that Phenicia and even neighboring countries are included (Delitzsch, "Paradies," p. 271). The Babylonian letter-group Im-martu, or Mar-tu for "West," hardly belongs here, but because of the similar sound in its earlier form it was written for Amurru in the Amarna tablets and still more frequently afterward in the extended signification of Amurru. At present it is not very easy to show the connection between the monumental Amorites and the Palestinian Amorites of the Bible. Winckler ("Gesch. Israels," i. 52) assumes that the Amorites, somewhere about the time of the El-Amarna tablets (after 1400 B.C. ), descended into Palestine from their original northern habitations. He supports this by the fact that only those of the earlier Biblical traditions, which belong to the northern kingdom, contain the name Amorites; namely, the prophet Amos and those parts of the Pentateuch which the critics assign to E., the Elohistic or Ephraimitic writer (followed by Deuteronomy). For this critical distinction in the use of the name see E. Meyer, in Stade's "Zeitschrift," i. 122. Budde, in "Richter and Samuel," xvii. ascribes Judges, i. 34, to the Judaic or Yahwistic writer, but see above on the probably indistinct and not very archaic use of the name in that passage. Wellhausen ("Die Composition des Hexateuchs," ii. 341) assumes that Amorites and Canaanites are synonymous expressions, only that the former is used of the Canaanites exterminated by Israel, the latter to distinguish them from those living among the Israelites at the time of the kings. These conclusions are suggested by the circumstance that the territory of the Amorites as described above leaves very little room for the Canaanites in the territory occupied by Israel, and that both terms sometimes seem to be used interchangeably (compare Gen. xiv. 13 with Judges, i. 10; Num. xiv. 45 with Deut. i. 44 et seq.). Thus Amorite would be the more ancient name, obscure even to the earliest writers. It is not certain that these writers were influenced by the etymology of the word. If Amorites were equivalent to "highlanders," we should have to compare the application of the name to the highland of Judah (Num. xiii. 29; Deut. i. 7, 19, 20; Josh. v. 1, x. 6, xi. 32) as a secondary use or as a mere inference from the etymology. At present, however, that etymology has been discarded, as amir means "summit," not "mountains" or "highland." 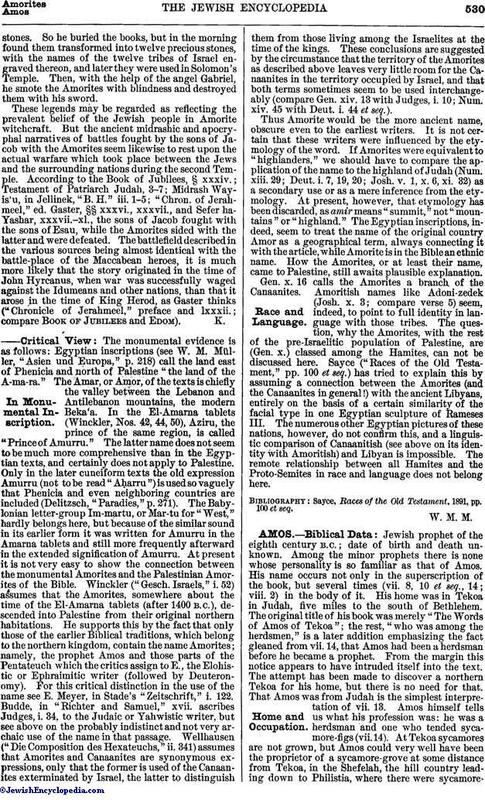 The Egyptian inscriptions, indeed, seem to treat the name of the original country Amor as a geographical term, always connecting it with the article, while Amorite is in the Bible an ethnic name. How the Amorites, or at least their name, came to Palestine, still awaits plausible explanation. Gen. x. 16 calls the Amorites a branch of the Canaanites. Amoritish names like Adoni-zedek (Josh. x. 3; compare verse 5) seem, indeed, to point to full identity in language with those tribes. The question, why the Amorites, with the rest of the pre-Israelitic population of Palestine, are (Gen. x.) classed among the Hamites, can not be discussed here. Sayce ("Races of the Old Testament," pp. 100 et seq.) has tried to explain this by assuming a connection between the Amorites (and the Canaanites in general!) with the ancient Libyans, entirely on the basis of a certain similarity of the facial type in one Egyptian sculpture of Rameses III. The numerous other Egyptian pictures of these nations, however, do not confirm this, and a linguistic comparison of Canaanitish (see above on its identity with Amoritish) and Libyan is impossible. The remote relationship between all Hamites and the Proto-Semites in race and language does not belong here. Sayce, Races of the Old Testament, 1891, pp. 100 et seq.